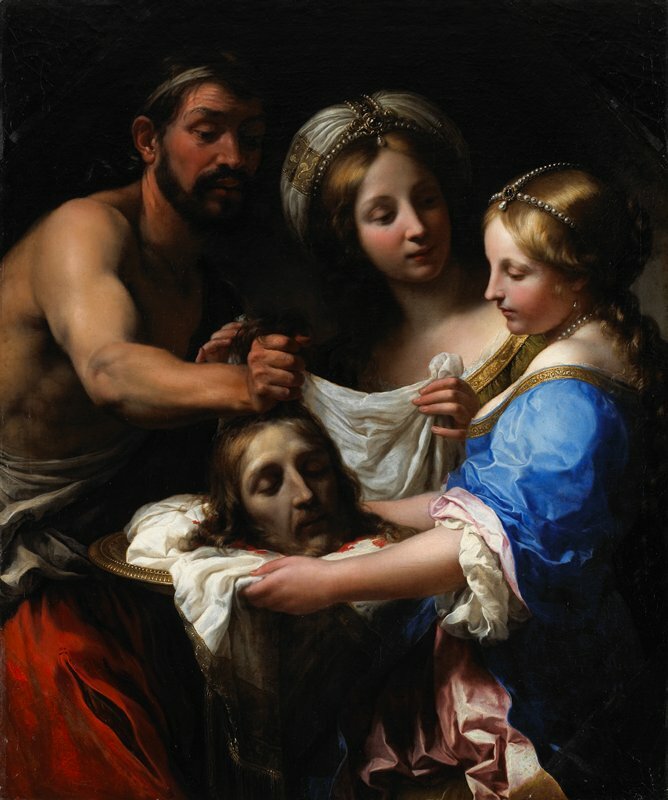 Grasping a gold plate holding John the Baptist’s severed head, young Salome presents this gruesome prize to her mother. Salome’s stepfather, King Herod, had granted her a wish after she danced for him at a banquet. Prompted by her mother, she asked for John’s head. John had accused Salome’s mother of adultery because she was previously married to Herod’s brother. Into this grisly scene the artist injected a dissonant elegance. Contrasting with the saint’s bloodied head and the shirtless executioner’s rough looks, mother and daughter are beautiful and refined, with porcelain skin and sumptuous attire that includes shiny pearls and elaborate headpieces. By Salome’s downturned head, Marinari suggested a pained remorse as she contemplates the result of her murderous request.